Her name was Luka and she was my only friend. At the age of 22 I was less than a year sober, lonely and living in a city where I knew no one but my co-workers. I was angry and scared. My fiance dumped me after cheating with another girl. Trusting no one, I still longed to be in love, to be loved, to find "the one". In my desperation, love eluded me, other than Luka. After work each day I would go home to my apartment and to my Luka Marie. Greeted with 30 minutes of meows, I imagined she was complaining about my being gone all day, how bored she was, and telling me what she did to entertain herself. Then after chewing me out, she would forgive me and rub against my leg, begging to be pet. Once I had gobbled down a frozen dinner, I would rush out the door to an AA meeting and directly back home to my Luka with her favorite treat. We cuddled in bed together sharing Butter Pecan ice cream, licking from the same spoon, watching TV. We savored the ice cream, and being together, until the ice cream was gone and I dropped off to sleep, only to start my sad process over again the next day. She was my friend, my loving, patient friend, and I was so grateful to have her. 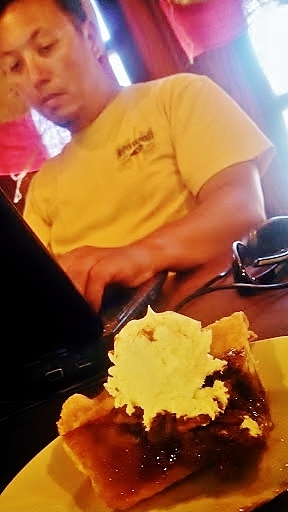 Eating Pecan Pie 25 years later in Tulsa, that flavor takes me to those days. The sadness is now gone from my life, the past now rest in the past, and my days are filled with love and adventure. Had I known it would come to this I wouldn't have worried so about someone to love and being loved. I had a friend in Luka and it turns out that she was all I needed in a time of heartbreak. I wish I could have appreciated all I had. My entire life was ahead of me, yet I had no patience for the process of time. Today I look across the table and see my best friend, my husband Steve, and smile. I don't want today to end, although I know it will, because now, I understand the process of time. Today will be tomorrow and tomorrow makes no promises. I have now, and grateful or not, now doesn't last for long. The only thing guaranteed is change. Sometimes that is good and sometimes that is not. It seems that few things stay the same in life. I'm grateful one of them is pecans.